I often try to forget or ignore stuff I have done that is embarrassing or hard to explain. (Maybe you do, too.) I look for ways to spin things so they sound awesome (or at least acceptable). But sometimes, turning points force me to recall my roots and not to ignore them. This week I plunged into just such a reverie, because a parish which I helped establish purchased some land recently and this week planted a cross there. 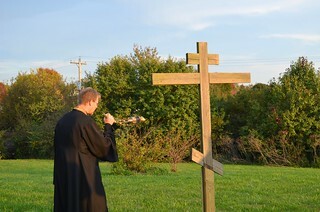 Unfortunately, I missed this beautiful service, but when I saw the photos online, the sight of that weathered old cross on the site of the church’s new property made me very, very happy. Let me tell you why. The roots of that cross go very deep for me and for that parish. Saint Athanasius Orthodox Church, just outside of Lexington, Kentucky, was founded about fifteen years ago. In those early days, we dreamed a lot. Boy, did we dream! But one dream stood out: A permanent home for our community. We were meeting and worshiping in people’s living rooms back then, so our little mission took a lot of commitment. We looked for several qualities in our dream location, but one quality we wanted, almost above anything else, was to be able to live close by. Living close to the church building makes it accessible. It removes the burden of distance so that we are able to simply and gracefully dedicate ourselves in service to others and prayer to God. In my lifetime, I have lived over an hour away from the nearest Orthodox churches, and I know how long distances make it difficult to participate beyond one worship service a week. (Sometimes you can squeeze in two, but often even just making it to one weekly service is too much!) We did not want that for ourselves. We wanted to be able to pray together often and then proceed from that communal prayer energized to serve to the surrounding community, a community we lived in. One property we liked very much back then was a vacant lot that fulfilled those dreams very nicely. Not only was it located close to a residential neighborhood like we wanted, but there were varying levels of housing and income levels, all within walking distance: 3 and 4 bedroom homes, townhouses, and several apartment complexes. Plus, the parish priest owned a home right next door! Often I would drive by this property and dream about a church there, but more importantly, I dreamed about living in one of the nearby apartments, close to my church and my friends, and then, maybe, moving up to one of those townhouses across the street or down the road (the ones situated around that huge pond are nice), and maybe, eventually, even buying a home in that neighborhood. To say we loved this property a lot would be an understatement. One of those early days, I happened to stop by the home of the parish priest. He was working on something in his driveway. Something big. He was building a very large cross from old lumber. I was filled with wonder and awe as I recognized the three bars of a traditional Russian cross emerging from the weathered beams. Eventually, he planted this cross in the northwest corner of his property — its highest point. The cross towered over a beautiful, terraced garden. It was the focal point of father’s back yard. But each time I saw it, I could not help but notice something else about its location. He had planted it right next to the fence separating his property from that vacant lot. Unfortunately, the owner had no interest in selling this property. It was an ideal location for business. It was adjacent to a Walmart and a shopping center, and the owner was hoping to lease it. So, we put that dream on the shelf. In the intervening fifteen years, much has changed. A storefront location was secured. I left for the Navy, returned, and then left for seminary. The founding priest took a senior position at an Orthodox mission center in Florida, and a new priest took his place. Property was purchased in the central Kentucky countryside, far from anything but a gorgeous vineyard and the winding Kentucky River. However, that countryside property did not work out, so the parish began scouting for locations closer to the town center. Did I mention there was a depression in the real estate market a few years ago? The current market opened the possibility of the sale of that original dream property. And that is how the tree of this old, rugged cross came to be planted just a few feet from its original location. The temptation to escape our past seems hard to resist sometimes. The difficulties and irregularities of life burst our ideals of the way things should be. We try to rewrite our histories and sand out the rough bits. But the weathered beams of the old, rugged cross refuse to be sanded down and smoothed over. And sometimes, the tree of the cross plants itself where it knows it belongs in spite of our best efforts to bend it to our will.